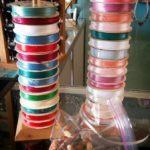 What makes the Beading Divas buzz? The Beading Divas take the month of July off. What could they possibly be doing to keep busy? Chill! Praying for rain! Taking more naps! Adopting more dogs! That’s right. Divas Michelle and Karyn adopted more greyhounds. Michelle adopted Sachi (Kaytie) and Karyn adopted Daisy (Dakota). Diva Lizzie had dentals for her greyhounds, is taking care of her friend’s greyhound while he travels and is working on Return of the Mermaids, a splashing event on 4th Avenue (August 13). Diva Loren is busy with gardening, swimming and taking her greyhound Mochi for early morning walks at Tucson Botanical Garden. Diva Cynthia is hiding from the heat. She worked especially hard in June as she is the Etsy fulfillment Diva. Last month’s group sold $1,800 worth of online sales so you know that kept Cynthia busy. She is also our treasurer. 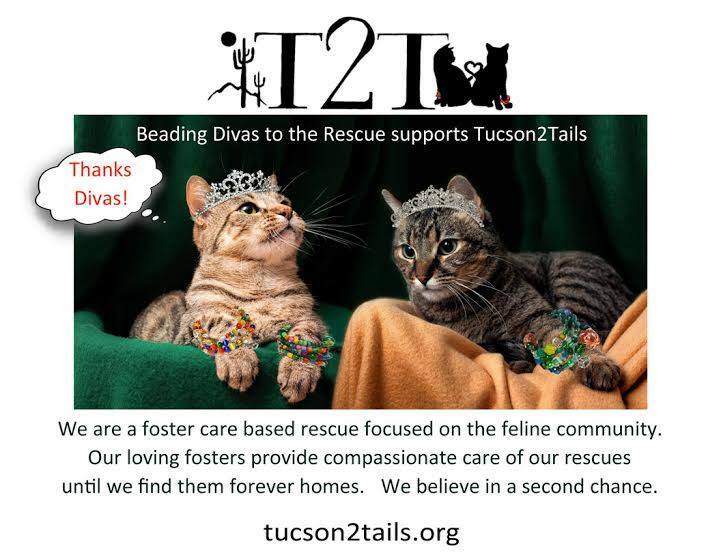 How do the Beading Divas raise money for charities? In its 7+ years, the Beading Divas have fine-tuned a strategy and process combining the best of skills. We couldn’t do what we do without donated beads. 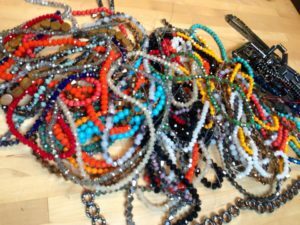 We occasionally have month-long bead drives (when the Tucson Gem Show comes to town) and last month had a mini bead drive at our Good Things Come in 3s Party. We’re fortunate that people find us online and give or send us beads all year long. Got beads? We can provide donation receipts. Diva Lizzie is in charge of buying large quantities of memory wire, findings and paw charms. We add business cards to the bracelets so always need ribbons which can be donated too. Michelle designs our business cards. While our bees buzz, we don’t sting. 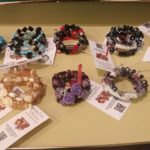 Once a month Diva Michelle graciously hosts a Beading Bee at her home. From 8 to 14 people (the regulars) come make bracelets, nosh on potluck food, laugh and talk. 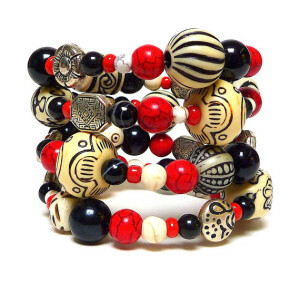 We can make 40 to 50 bracelets at one sitting. These Bees are crucial to our success of being able to fill inventory. 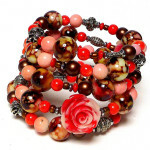 Bracelets are divided between Etsy (our online store) and Silver Sea Jewelry on 4th Ave. Michelle is the Etsy guru. She photographs bracelets and uploads them. 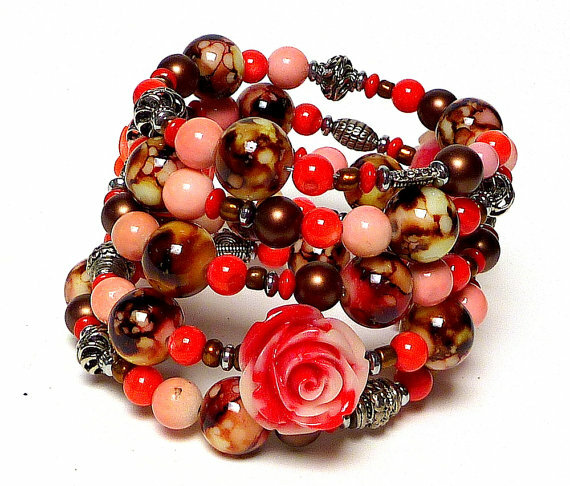 The Etsy bracelets then go to Diva Cynthia who does the Etsy fulfillment which means shipping and handling. Cynthia also provides customer service on Etsy. Bracelets going to Silver Sea usually need to have the business card added to each bracelet with a ribbon. 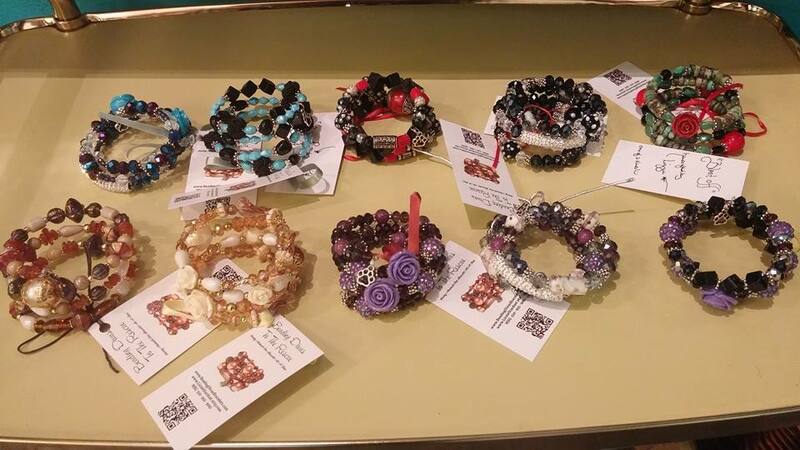 Bracelets at Silver Sea are picked up and taken to the other venues around town that generously sell bracelets. Divas Karyn, Mary Jo, Sandra and Loren pitch in going to AK Jensen Women’s Apparel, Clues Unlimited Mystery Bookstore and Spa Daze. If the monthly fundraising recipient is local, they come to Silver Sea to pick up bracelets to sell and drop off their laminated posters. If the group is not local, they mail posters. Every month (except July) we choose a different animal charity to fund-raise for. Normally, we do a consensus but when it’s your birthday month — each Diva can choose a group. The person choosing the group makes the initial contact. Diva Karyn mostly follows up with the group reminding them that she needs stories and photos for the blog and also reminds them of their deadlines as to when we need the posters and to keep promoting, etc. It’s the first of the month and a new group is chosen. Diva Karyn blogs a few times per month for each new group. Divas Michelle, Lizzie, Loren and Karyn promote on Facebook. Some groups run like the wind with this opportunity; using social media can bring in hundreds or thousands of dollars in sales, turning into always needed funds to save animals. 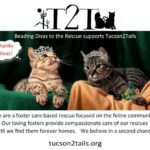 Dogs, cats, birds, pigs, ferrets, horses, wildlife, advocacy, spay/neuter, oh my! We have helped them all. 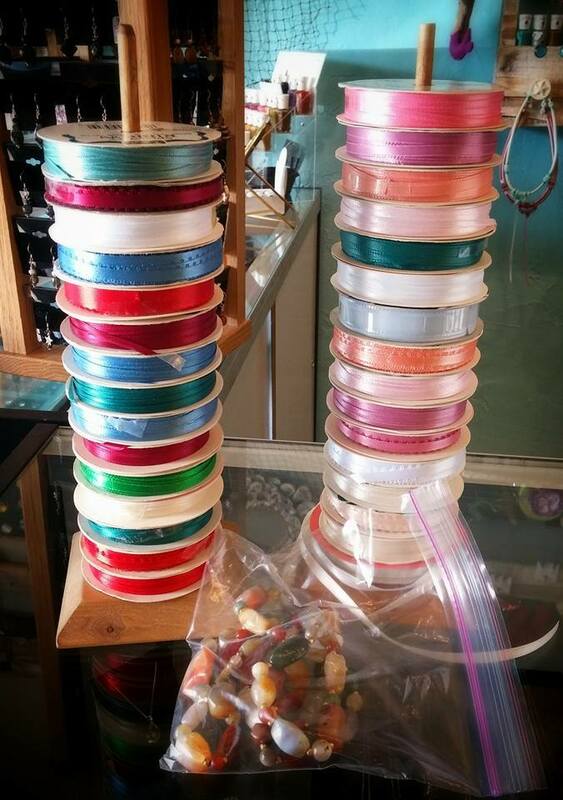 Thank you to everyone who has donated beads, makes bracelets, sells our bracelets, bought bracelets, and spreads the word about what we do –from Divas Cynthia, Michelle, Lizzie, Loren and Karyn.